The department is staffed by the Director of Security and eight (8) Security Officers. There is at least one (1) officer on duty per shift. 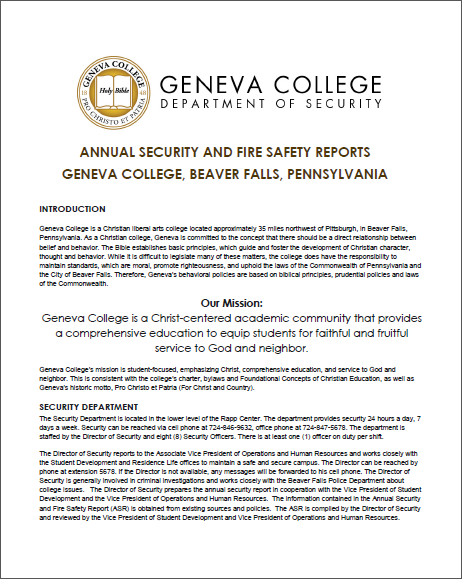 Geneva College is a Christian liberal arts college located approximately 35 miles northwest of Pittsburgh, in Beaver Falls, Pennsylvania. As a Christian college, Geneva is committed to the concept that there should be a direct relationship between belief and behavior. The Bible establishes basic principles, which guide and foster the development of Christian character, thought and behavior. While it is difficult to legislate many of these matters, the college does have the responsibility to maintain standards, which are moral, promote righteousness, and uphold the laws of the Commonwealth of Pennsylvania and the City of Beaver Falls. Therefore, Geneva's behavioral policies are based on biblical principles, prudential policies and laws of the Commonwealth. Geneva College is a Christ-centered academic community that provides a comprehensive education to equip students for faithful and fruitful service to God and neighbor. Geneva College′s mission is student-focused, emphasizing Christ, comprehensive education, and service to God and neighbor. This is consistent with the college′s charter, bylaws and Foundational Concepts of Christian Education , as well as Geneva′s historic motto, Pro Christo et Patria (For Christ and Country). The Director of Security reports to the Vice President of Information Technology Services / CIO and works closely with the Student Development and Residence Life offices to maintain a safe and secure campus. The Director can be reached by phone at extension 5678. If the Director is not available, any messages will be forwarded to his cell phone. The Director of Security is generally involved in criminal investigations and works closely with the Beaver Falls Police Department about college issues. The Director of Security prepares the annual security report in cooperation with the Dean of Student Development and the Vice President of Information Technology Services / CIO. The information contained in the Annual Security and Fire Safety Report (ASR) is obtained from existing sources and policies. The ASR is compiled by the Director of Security and reviewed by the Vice President of Student Development and Dean of Information Technology Services / CIO. The Campus Safety Department maintains a close working relationship with local, county, state and federal law enforcement agencies as well as the Beaver Falls Fire Department, Medic Rescue and the Beaver County 911 Center. Major crimes are reported and handled by the Beaver Falls Police department. Lesser crimes are handled by the Security Department and processed through the College student conduct process.